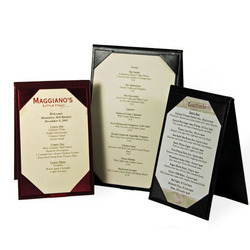 Triple-panel design holds (4 Sheets) perfect for fitting 8.5 x 11 menu sheets. Photo album-style corners prevent a menu sheet from falling out of the display yet make it easy to update a presentation. Hardcover panels keep a menu protected; great for stacking in-between uses. Synthetic leather materials easily wipe clean with a damp cloth. Top Quality And Finish, Must for stylish presentation. 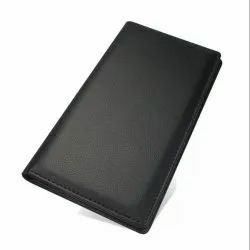 We are offering Vertical Silver Stand Cover to our clients. 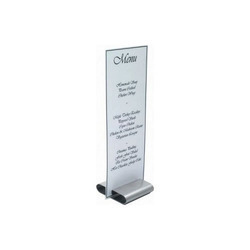 We are offering Silver Menu Stand Holder to our clients. 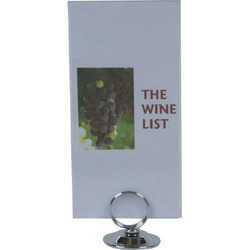 We are offering Menu Stand Holder to our clients. 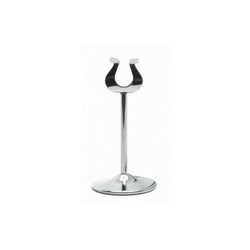 We are offering Round Stand Holder to our clients. 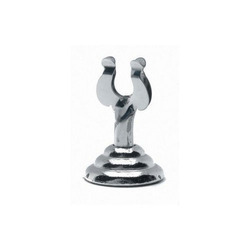 We are offering Stand Holder to our clients. 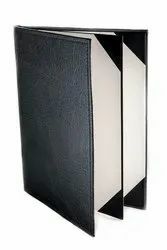 Looking for Leather Restaurant Folders Table Stands ?